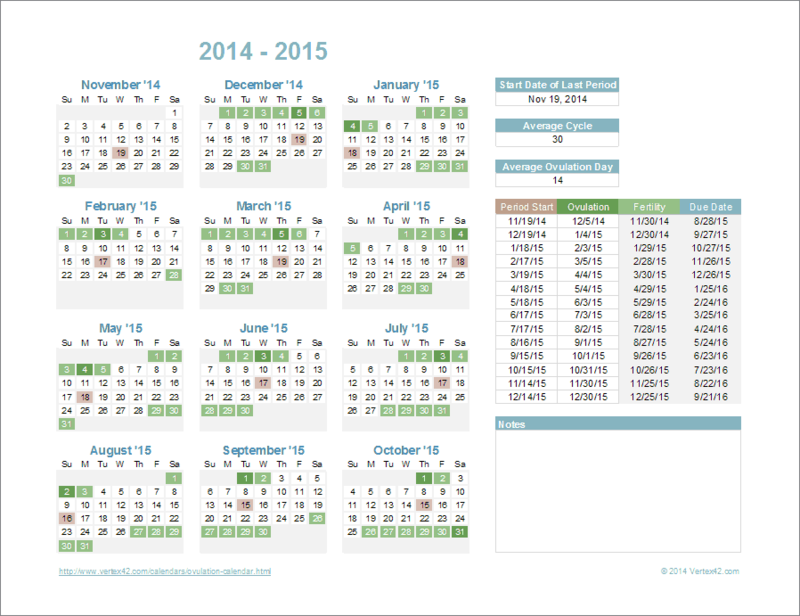 This ovulation calendar template was designed to help women who want to have children. The spreadsheet lets you enter the start date of your last period and your average cycle length. Then it estimates future ovulation dates and fertility windows. You can also use it to track actual period and ovulation dates, which may be helpful when consulting a fertility specialist. Read below for information about the assumptions and calculations built into the calendar. "No installation, no macros - just a simple spreadsheet"
In this calendar, the ovulation date is displayed as dark green and the estimated fertility window is shown as light green. You can track actual period start dates and ovulation dates by entering the dates manually in the table to the right of the calendar. This can be useful if your cycle is not regular. IMPORTANT: This ovulation calendar should not be used to prevent pregnancy, because just knowing when you may ovulate is not a reliable birth control method. 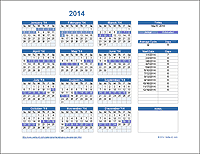 This calendar should only be used as an aid for women wanting to have children. The ovulation date is generally calculated to be 14 days prior to the start date of your period. The spreadsheet lets you adjust that value if you know it to be different in your case. This calendar shows the fertility window starting 5 days prior to ovulation [See 1-2]. It is also common for the window to include a day or two after the estimated ovulation date [See 3-4]. The table to the right of the calendar shows the pregnancy due date calculated to be 266 days after ovulation. How to Calculate Your Fertile Window at ivf.com.au - This resource includes an online calendar for predicting your next couple of ovulation dates. Web-Based Ovulation Calculator at babycenter.com - A calculator for predicting your next ovulation date and fertility window. Online Ovulation Calculator at WebMD.com - Shows a 2-month ovulation calendar with a fertility window 2 days before and 2 days after ovulation. DISCLAIMER: The ovulation calendar and the information on this page should not be used for medical advice, diagnosis, treatment, or in place of professional medical care. Consult a qualified professional for medical care or therapy.